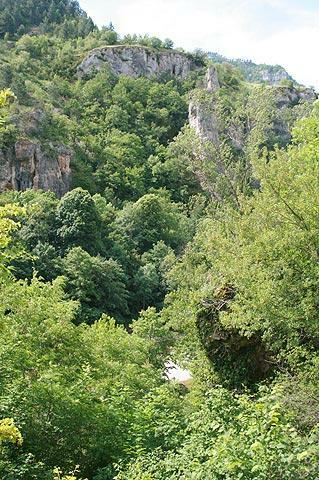 The Tarn Gorges are dramatic gorges running from Le Rozier, north of Millau, to Quézac, in the Lozère department of the Massif Central, northern Langudoc-Roussillon. 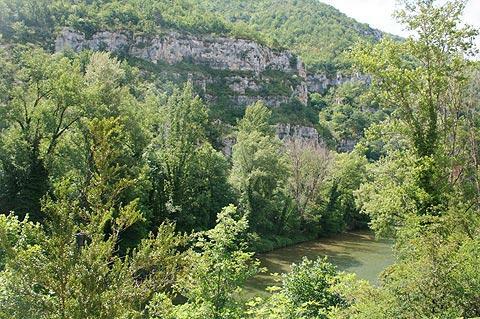 Following the course of the Tarn River for 50 kilometres, the Tarn Gorges are among the deepest gorges to be found anywhere in Europe. They are also extremely picturesque - one of the most scenic parts of France - and offer several great vantage points from where to enjoy their beauty. The old stone bridge at Quezac represents the north-eastern limit of the Gorges du Tarn and Les Vignes is considered to be the south-western end, but don't ignore the river valley outside these places however, because it is still very beautiful. A scenic road follows through the gorges and makes exploring them very easy - it also has lots of stopping places, although not always in quite the place that you want to stop! There are several attractive villages in scenic locations along the route that you will want to visit, including Montbrun, Castelbouc and Sainte Enimie. 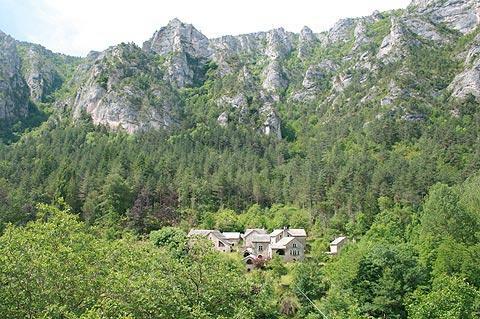 Other good stopping points include Blajoux and the 'built in a cliff' village of Pougnadoires. Castelbouc is a small but very picturesque village (if you don't have time to visit the village itself be sure to stop at the viewpoint for the village, on the main road); while Sainte-Enimie is a busy riverside town with a very lovely medieval village behind it. Nearby Saint-Chely-du-Tarn is also very picturesque. The road that follows along the gorge is quite busy in the summer, but is very much worth the effort because the scenery is quite exceptional. 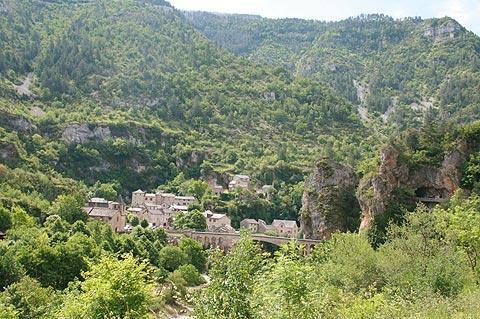 Allow plenty of time to stop and gaze at the pretty ancient hamlets and towns, and to admire the Gorges du Tarn from the many scenic vantage points. 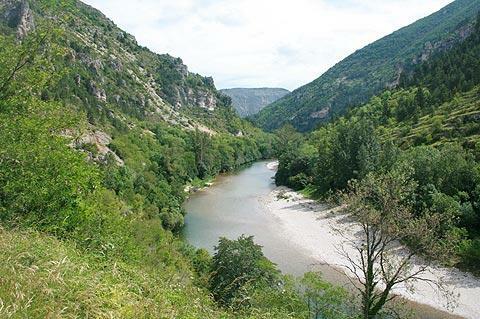 Two of the most impressive hamlets are situated towards the western end of the Gorges du Tarn, at Hauterives and La Croze*. You can admire them from the road, but they are inaccessible to cars, and can only be reached by canoe or by walking. *Interestingly, both of these hamlets had started to fall into disrepair, as river trade gave way to road trade, but now have wire 'lifts' installed so that materials etc can be transferred in from the road - this has given them a new lease of life, as the buildings can now be renovated. From within the gorges you have plenty of opportunities to enjoy beautiful scenery but you don't have a 'global view' of the gorges - it is necessary to make a detour for this. 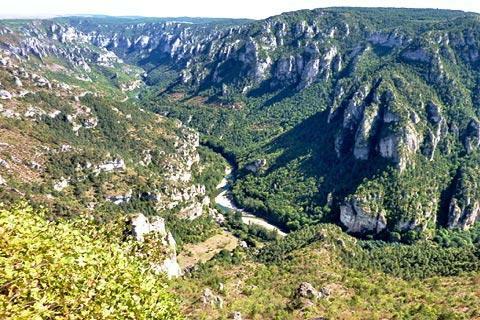 Perhaps the best of all views of the gorges is from Saint-Georges-de-Lévéjac, 15 kilometres north of Le Rosier, at the so called 'point sublime' which has very far-reaching views down the canyon, with cliffs on either side soaring to 500 metres high. Note that this point is not easily accessible from the road that runs through the gorge and a detour of perhaps 20 kilometres is necessary. Not surprisingly the area is very popular for outdoor sports, including hiking and canoeing. There are numerous possibilities for both of these sports and the tourist office at Sainte-Enimie will be able to advise you - along with information about other attractions in the region, including caves/grottes and the Chateau de Peyrelade. Of interest also (for children and adults alike) is the "Park of Chaos of the Montpellier-le-Vieux" - a little to the south of Peyreleau, and with curious rock formations, weather beaten over the years into various arches, animal shapes etc. 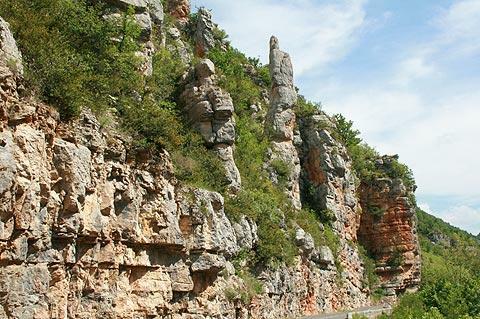 Another local highlight, between the Gorges du Tarn and the Mont Aigoual, is the Abime de Bramabiau, a network of dramatic gorges formed by the little 'Bonheur' stream and millions of years of erosion. 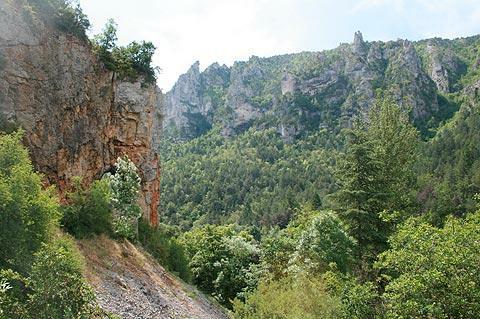 If you are staying in this region for a few days we also recommend you explore the Gorges de la Jonte and the Gorges de la Dourbie, to the south of the Gorges du Tarn. Although less well known than the Gorges de Tarn they are still very scenic and also much quieter. The town of Florac, a small but picturesque town to the east of the gorges, makes a pleasant base and is in a scenic setting surrounded by mountains.